The real battle for the future of the Supreme Court is not his nomination but the presidential election—the winner will determine the shape of constitutional law for generations. Two things are clear with respect to the nomination of Judge Merrick Garland to the Supreme Court: Judge Garland is eminently, indeed supremely, qualified; and the Republicans are dead set against giving him even a hearing, much less a vote. What’s obscured by the heated rhetoric that already surrounds the fight, however, is that the real battleground for the future of the Supreme Court is not this nomination but the presidential election. Once Republicans understand that, they may well come to rue the day they committed themselves to blind obstructionism. Garland’s qualifications for the Court are unparalleled. A star graduate of Harvard College and Harvard Law School, he clerked for two of the nation’s finest judges, William Brennan and Henry Friendly. He has practiced in the private sector and as a high-level federal prosecutor, where he coordinated the investigation and prosecution of the 1995 Oklahoma City terrorist bombing and was involved in the prosecutions of Unabomber Ted Kaczynski and DC Mayor Marion Barry. He has served on the US Court of Appeals for the DC Circuit for 19 years, where he’s earned the respect of litigants from both sides of the aisle and now serves as chief judge. He writes careful, narrow opinions. All who know him, and I am one (my wife is also a DC Circuit judge), describe him as a fundamentally decent and humble human being. He also happens to be, without question, the most moderate selection that conservatives could have plausibly hoped for. Despite Garland’s having spent two decades deciding controversial federal cases, conservatives have yet to identify any decisions they can attack. Some gun-rights advocates have cited his vote to rehear en banc a DC Circuit panel decision that invalidated the district’s local handgun ban, one that the Supreme Court eventually overturned as well. But that vote was hardly radical, as for more than 100 years the lower courts have held that the Second Amendment doesn’t protect an individual right to bear arms, and the DC Circuit panel ruled the other way. Liberals might not like Garland’s vote to deny habeas corpus review to Guantánamo detainees in the first case to take up that issue, but at the time, Supreme Court law appeared to be strongly opposed to such review. In both cases, Garland simply followed existing law. Because Garland is so moderate, Republican Senator Orrin Hatch has at other times sung his praises, as have several conservative bloggers such as Ed Whelan. Known for his knee-jerk attacks on Obama appointees, Whelan conceded in a telephone interview with the press that the only basis conservatives have for opposing Garland is that he is liberal. Not out of the mainstream, unqualified, or an extremist—just liberal. Yet oppose him the conservatives will. Within hours of Justice Antonin Scalia’s death, Senate majority leader Mitch McConnell announced that the Senate wouldn’t vote on any candidate nominated by Obama. Shortly thereafter, all of the Republicans on the Senate Judiciary Committee issued a letter pledging not to provide any such nominee a hearing. The fact that the Senate’s constitutional duty is to provide advice and consent, and that the last time the body refused to vote on a Supreme Court nominee was 1875, is apparently no deterrent. Thus far, the Republicans have shown no sign of wavering now that they know who the nominee is—even though they can’t cite any legitimate reason to deny Garland confirmation. The Republicans’ obduracy is unconscionable. But it does have one salutary consequence: It underscores the importance of the current presidential election. After November 8, they will no longer have grounds for stalling. And when it comes to the Supreme Court’s future, everything depends on the next election. The next president, whether it’s Bernie or Hillary or Ted or Donald, will almost certainly have the opportunity to name several new justices. In addition to Scalia’s vacant seat, at least one more is likely to open up, since three of the justices—Ruth Bader Ginsburg, Stephen Breyer, and Anthony Kennedy—will be over 80 during the next president’s term. If Trump or Cruz were to replace Ginsburg or Breyer, the Court would be solidly conservative for at least a generation even if Garland were confirmed. And conversely, if a Democrat wins the next election, she or he will have the opportunity to fill Scalia’s seat, and quite possibly Kennedy’s as well, thereby cementing a liberal majority for the foreseeable future. 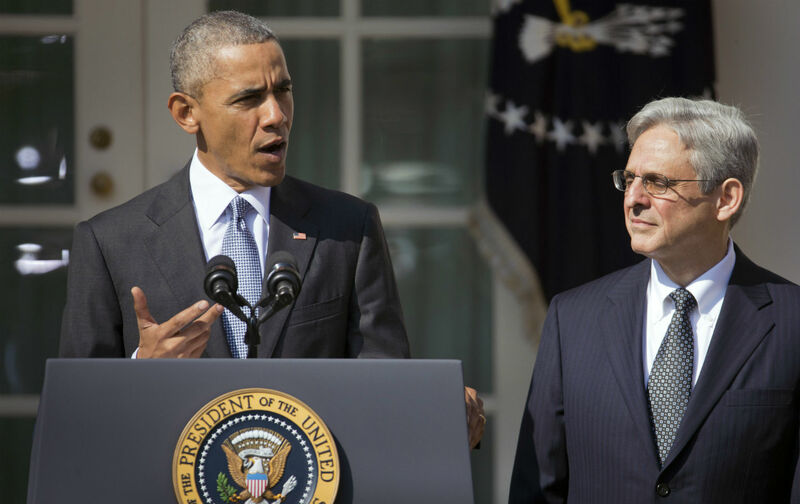 Merrick Garland deserves a hearing, a vote, and a seat on the Supreme Court. The Republicans’ stubborn opposition is extreme, partisan, and obstructionist—in short, fully in keeping with their character over the rest of Obama’s two terms. If this stonewalling in the face of such a qualified nominee hurts the GOP in the presidential election, their tactics will have backfired—because in the long run, who wins the next election is much more important than whether Garland gets confirmed. So if Donald Trump and Ted Cruz weren’t already sufficient motivation, this is yet another reason Nation readers should enthusiastically and vigorously support Hillary Clinton when, as now seems increasingly likely, she wins the Democratic nomination. Bernie Sanders may sound more like a Nation columnist, but even his most fervent supporters must realize that Hillary can win the presidency only if progressives embrace her campaign in the general election. Whoever prevails this fall will determine the shape of constitutional law for generations to come, affecting many of the issues closest to Nation readers’ hearts—including civil rights, privacy, campaign finance, the environment, labor, the protection of dissent, and fairness in the criminal process. We must not let that opportunity elude our grasp.